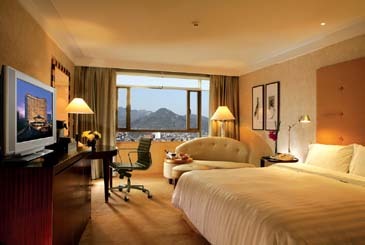 The Westin Chosun Seoul, Wednesday, August 30, 2006- Taking great pride in our efforts to continually exceed our guests' expectation and satisfaction, The Westin Chosun now presents newly renovated guest rooms with enhanced luxuries that promise even more superior guest experience. Taking our guests' health and safety concerns into careful consideration, the rooms have been impeccably refurbished with anti-allergy carpets, smooth wooden floorings, and a slim designed safe. Guests can also enjoy our ultra-modern Premium Espresso Coffee Maker and our fantastic Digital TV Information Service, featuring a 32 Inch Flat Screen LCD TV with Cable Channel, Pay Movie, and an excellent search engine for room service, restaurant menus, hotel directory and local attractions. An interactive service option also allows guests to conveniently check-in/out from the comforts of their own room. Business guests around the world will appreciate our new luxurious and commodious Business Deluxe Room, Business Deluxe Guest Office and Executive Deluxe Room, which offers the leisurely comforts of home combined with stellar business support and convenience. Our Guest Offices provides an in-room desktop PC with unlimited Internet access, and also a printer, copier and fax machine upon request. Our advanced amenities also include upgraded high-speed 10Mbps LAN connection, Internet service by dial-up modem, mobile phone with personal number, and a full-size writing desk with an office task chair. The top-quality features and sophisticated business atmosphere ensures that guests will experience the utmost efficiency in handling their demanding workload in their own personal office.